Is free tuition the writing on the wall for college as a personal expense? LaSonya Moore is an assistant professor of special education in the College of Education at the University of South Florida in St. Petersburg. Edward Renner is a courtesy professor at USF. Is New York University School of Medicine's announcement of free tuition the beginning of an inevitable evolution toward free public higher education in the U.S.? Since the 1960s, college enrollment has steadily increased until it peaked in 2011 at 20.6 million students. 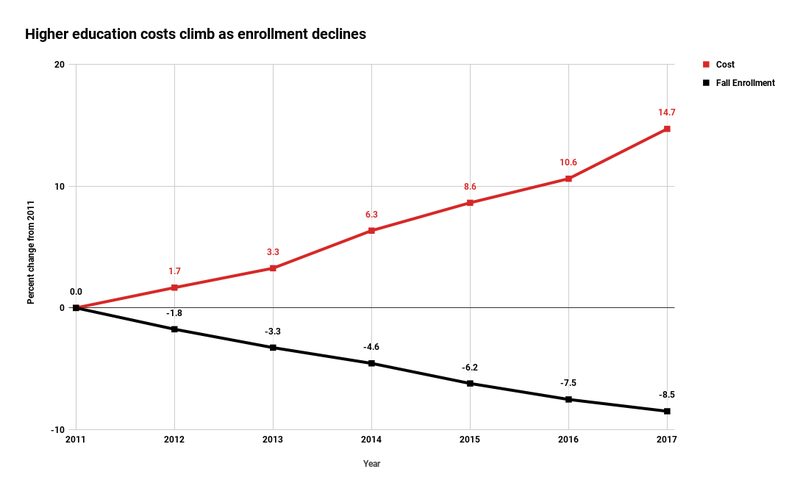 Over the next six years there has been a steady decrease in enrollment, down to 18.8 million in the fall of 2017, according to the National Student Clearinghouse Research Center. This period has been marked by a series of institutional failures, and the creditworthiness of institutions of higher education has been downgraded by Moody's. Over the 56 years the Higher Education Price Index has been computed by Commonfund, it has outpaced the Consumer Price Index by about 160% and has maintained that pace over the past six years with 2017 showing the largest one-year increase since 2008. One result has been an unsustainable corresponding growth in the size of student loan debt. In partial response, curriculums have been adjusted to be more practical and job-centered, increased focus has been given to student recruitment and retention, and colleges and universities are even competing for transfer students. While strategic planning is certainly required, it alone will not be sufficient if the six-year graph is capturing an inflection point that is the beginning of a long-term trend. Such a divergence of enrollment and costs is related to two additional issues, for which there is growing awareness. The limiting case for the two trend lines is consistent with the prediction by Harvard Business School Professor Clayton Christensen that more than one-half of higher education institutions will be bankrupt over the next decade or so, following Circuit City, encyclopedias and others as the victims of "disruptive innovation." Looming in the background is an economic crisis for educational institutions similar to that experienced in 2008 by financial institutions. With the continual expansion of open educational resources (OER), the availability of massive open online courses (MOOCs) and independent certification of competence, there is reduced educational need for a traditional college experience. While the doubling rate of knowledge is difficult to measure, the suggestion that half of what one learns over a four-year degree will be outdated by graduation suggests an alternative role to be filled by nonresidential, remote digital continuing education. In practical terms, if costs continue to rise, fewer students will be willing to assume increasing amounts of debt. Over recruiting of marginalized students and diluted standards may provide temporary numerical relief, as they did for for-profit institutions, but in the longer-term they will deepen disillusionment and public confidence, setting the stage for a future larger crisis. Such a crash is increasingly likely with limited annual economic growth in a time of rapidly increasing national debt. Projecting increased costs and reduced enrollment to their limit provides a graphic picture of the richest 1% bringing a ton of money to the registrar of the remaining institutions to purchase the additional social, cultural and civic benefits of the four-year college experience — all while the 99% stand by looking on. If disruptive innovation and even greater inequality are the outcome of sticking with the status quo, then tinkering with enrollment strategies, student loan forgiveness, deferred maintenance, more adjuncts and practical job training will not be sufficient. If the goal is to ensure the K-16 pipeline is possible, a much bolder vision will be required. Free tuition for all at public institutions may be a necessary policy debate to have in the U.S. today. The pending economic crisis facing public institutions could offer the opportunity of following other Western democracies by restructuring financial support as a public cost, rather than bailing out the status quo as was done in 2008 for the financial system. This would create an education system where excessive wealth cannot provide, nor poverty deny, access to public higher education, and where only competitive ability and personal motivation are the currency of exchange for entry. In addition, such a change may be the only way to achieving a nationally competitive world-class workforce that is inclusive of the 99%. Without radical thinking, the writing on the wall suggested by NYU Medical School's announcement of free tuition may signal the beginning of the end of the dead idea that knowledge is a commodity to be purchased as a personal expense, rather than a national investment in the future of the nation itself.